DECIDING FACTORS MMS JANUARY 2018 22 mmsonline.com Data-Driven Manufacturing MTConnect and OPC UA Have Their Place Although OPC UA and MTConnect are both http- based protocols (which makes them usable on internet-enabled networks), the question why MTConnect exists often arises since OPC UA has been around for a while and has wide support through- out industry. While similar in some regards, they are distinctly different in structure and purpose. Each has its advantages and disadvantages. Likewise, the scenarios in which they should be used are not the same. 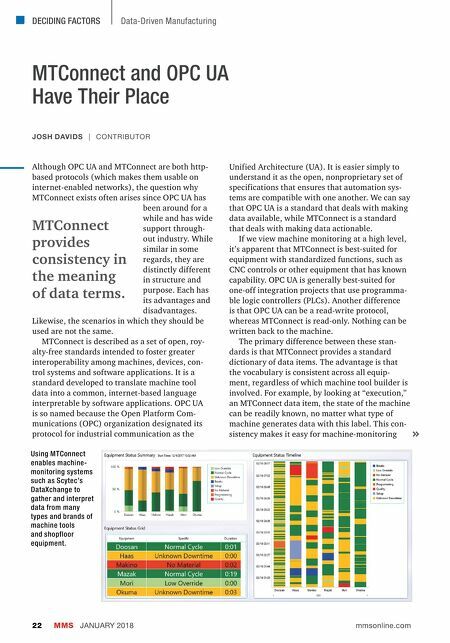 MTConnect is described as a set of open, roy- alty-free standards intended to foster greater interoperability among machines, devices, con- trol systems and software applications. It is a standard developed to translate machine tool data into a common, internet-based language interpretable by software applications. OPC UA is so named because the Open Platform Com- munications (OPC) organization designated its protocol for industrial communication as the Unified Architecture (UA). It is easier simply to understand it as the open, nonproprietary set of specifications that ensures that automation sys- tems are compatible with one another. We can say that OPC UA is a standard that deals with making data available, while MTConnect is a standard that deals with making data actionable. If we view machine monitoring at a high level, it's apparent that MTConnect is best-suited for equipment with standardized functions, such as CNC controls or other equipment that has known capability. OPC UA is generally best-suited for one-off integration projects that use programma- ble logic controllers (PLCs). Another difference is that OPC UA can be a read-write protocol, whereas MTConnect is read-only. Nothing can be written back to the machine. The primary difference between these stan- dards is that MTConnect provides a standard dictionary of data items. 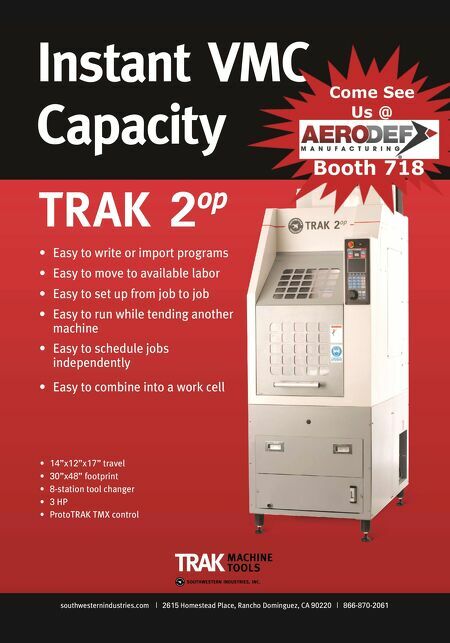 The advantage is that the vocabulary is consistent across all equip- ment, regardless of which machine tool builder is involved. For example, by looking at "execution," an MTConnect data item, the state of the machine can be readily known, no matter what type of machine generates data with this label. This con- sistency makes it easy for machine-monitoring MTConnect provides consistency in the meaning of data terms. JOSH DAVIDS | CONTRIBUTOR Using MTConnect enables machine- monitoring systems such as Scytec's DataXchange to gather and interpret data from many types and brands of machine tools and shopfloor equipment.